With comprehensive electronic and traditional publishing capabilities, Designer is drawing tool perfectly suited to the needs of the enterprise. Anyone who creates logos, desktop publishing or advertisements will benefit from Designer's easy to learn interface and highly productive tools. Designer gives users a whole new level of accuracy and precision in technical illustration. 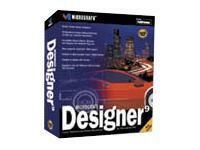 It delivers sophisticated symbol creation and editing features, impressive text handling, and more. Yet it's all surprisingly easy to learn and use.